Affordable Town Home in Great Location – Why Rent? Why throw away money in rent when you can buy? Or better yet, why not become a landlord? This beautiful 3 bedroom, 2.5 bath town home in Mulberry Park is a great investment! With great rental potential you could live here for a couple years and then move up to your next property. That’s how you build wealth in real estate. Is it an option you’ve never considered? Contact Us today for a personalized investment consultation. It might just be easier than you think to get started investing in real estate. Whether you live here or rent it out, anyone would love to call this bright, open space their home. The floor plan is spacious with a cathedral ceiling in the living room adding to the airy feel. A separate dining room and and first floor master suite offer more space. Hardwood and crown molding on the first floor give a luxurious touch. 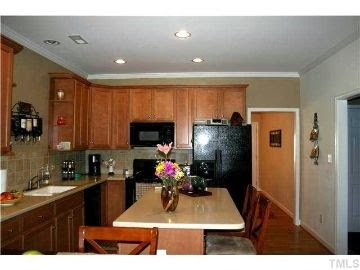 The upgraded kitchen offers 42″ cabinetry and a center island with bar overhang – a lot of kitchen space for a town home. Large secondary bedrooms and loft on the second floor create a great separation of living spaces. Perfect for roommates! Enjoy the outdoors on a large screened porch and patio. You can’t beat this great location and fantastic price! This is the perfect opportunity for a first time buyer! 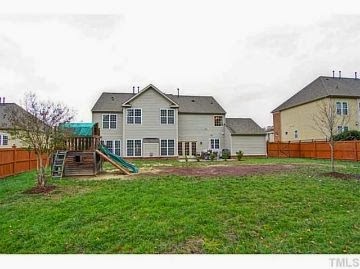 Are you looking for a HUGE yard and plenty of space to spread out and a great friendly neighborhood? If so, this is the perfect home for you! This gorgeous 5 bedroom, 4 bath home is in the Harmony subdivision, one of West Cary’s best neighborhoods. Picture perfect, this home is move in ready for you. Featuring stunning 5 inch hardwoods throughout most of 1st floor for ease of living, you will love the comfortable luxury this home offers. A separate formal dining room with coffered ceiling and wainscoting is a real show piece for entertaining. Extensive trim work throughout the home gives it a custom feel. The 1st floor bedroom with a full bath is great for in-laws and guests. But they may never want to leave! A gleaming upgraded kitchen with cherry cabinetry, granite counter tops, custom tile back splash, under cabinet lighting, a 5 burner gas stove top and range hood will make you feel like a top chef. Get away to your own private retreat in the huge master suite with sitting area. The completely fenced, flat backyard is like having your own private park to run free. A large patio is the perfect start to create a dream outdoor living space. Contact Us at Lisa Southern Real Estate today for a personal tour of the luxurious home. If you are new to the area, here are some links for local information in this area of Cary. 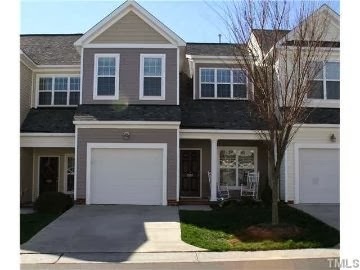 West Cary is highly regarded as one of the best places to raise a family in the Triangle area. The Harmony neighborhood is one of the most sought after in the West Cary area. With convenient access to all of the metro area, yet the small town charm Cary has to offer, this is the perfect place to call home. Excellent schools, plenty of parks and recreation and friendly communities are just a few of the reasons locals love this area. 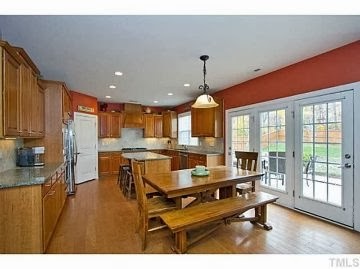 Contact Us today if you are considering relocating to the Raleigh metro area.